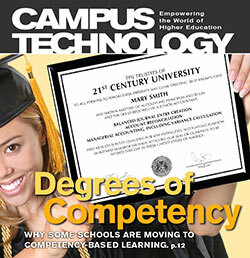 Why some schools are moving to competency-based learning. Today's schools need 24/7 IT support, but both outsourced and homegrown solutions pose serious challenges. A CIO shares his strategies for implementing a turnaround plan that can get your campus moving in the right direction. A new initiative uses the cloud to automatically customize any device for students with disabilities. Even though digital resources are now front and center in higher ed, libraries still must work hard to integrate them into their schools' LMSes.